Up until my mid-20's, I used to be an avid reader. I'd read anything you'd put in front of me, but my favorite genre has always been fantasy/science fiction. Unfortunately, as I've gotten older, my love of books has all but disappeared. I blame the internet and having twins. :P That said, I still love a good story, I simply choose to get that from movies rather than books, nowadays. So, when the news hit last year that Jennifer Lawrence had snagged the lead of Katniss in "The Hunger Games" movies, my first thought was "what and who", but after a quick Wikipedia search, I was able to know all I needed to know to decide that I was 1. in love with the storyline and 2. couldn't wait until it came out. Then, I got the press release that China Glaze was releasing a collection based on the movie and I immediately got giddy. I liked all of the colors on the swatch sheet, but I had my favorites, Smoke and Ashes, Agro, Riveting, and Electrify. A couple of days ago, I got a small package from China Glaze containing 2 polishes from this collection, and as luck would have it, I received 2 of the colors I initially loved from this collection, Smoke and Ashes and Electrify. Electrify - dense gold and red glitter. You all know how much I love my glitter-bombs, right? And this baby is no exception. I adore this one. Maybe it's the Aries in me, but I can't get enough of the combination of fiery colors. I love that the red glitter is larger than the gold glitter. Application was good on this one. I was able to reach opacity in 3 coats, though the picture above is 4 coats. I know in the macro picture, you can see gaps, but to my eye, it looked like it completely covered my nail. One thing I do want to mention, is that for my first 2 coats, I placed the polish on my nails, rather than using typical strokes. It made for much less drag, and then I evened it out with the latter coats. I really loved this polish. I think this would look fabulous in the fall over a golden or red polish. This one reminded me of the glitters from RBL, both in application and overall look of the polish on the nail. 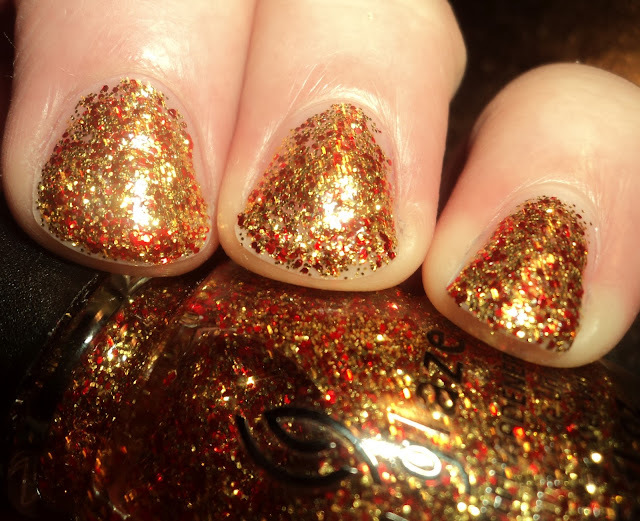 So, if you love the RBL glitters or loved them and never got them, you may want to check this one out. 4 coats. Smoke and Ashes - Black/green shimmer with blue and green glass fleck. There are some gorgeous polishes in this collection, but this one stood out to me on the swatch sheet. I like the cremes in this collection, but if there is one thing that China Glaze does exceptionally well, it's their glass-flecked shimmers. This one is amazing. The color on it is so dark and yet, it's obviously a green, and the shimmer is fantastic. It reminds me of a greener version of the long-discontinued China Glaze Blk-Bila-Bong. Formula and application were perfect. 2 coats. The press release states that the collection will be released in early March, before the movie's March 23rd release. However, I know that I have seen these for sale already on various websites and on eBay.